Only 20 years old and with a new fashion label under her belt, Samantha Cobos is a young force to be reckoned with. 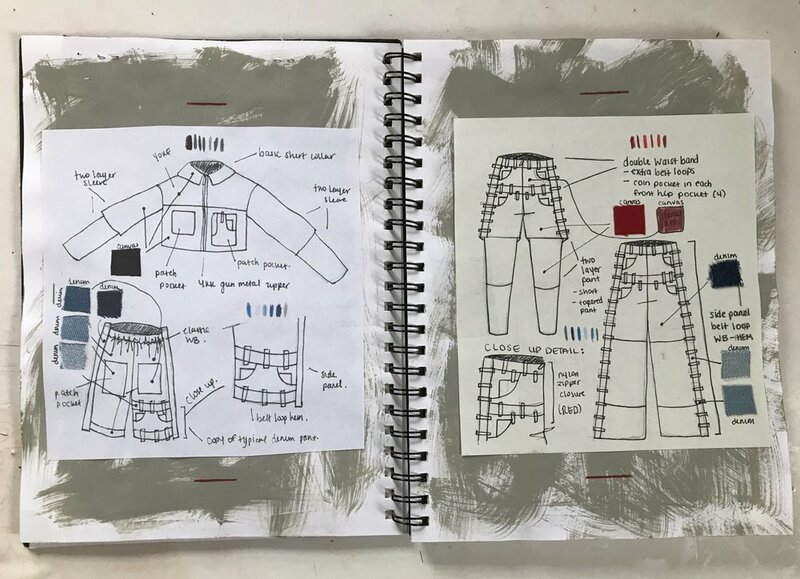 While currently attending the Fashion Institute of Technology, Cobos is also in the process of launching her second collection of her unisex clothing company, XE, this fall. Cobos aims for her brand to break the boundaries that society sets for men and women's fashion norms. The spirit in her collection sets a flame on the current norms in the fashion industry of what women and men should and should not wear by including unique and diverse pieces, fit for any gender. When Cobos was just 16, she auditioned for the Lifetime show Project Runway Junior. Once Cobos started the show, she quickly turned fashion design into her new passion and knew it would be a place she could see herself growing professionally. "I would say once I auditioned for Project Runway Junior, I knew this was something I took really serious," Cobos tells Blended. During the show, Cobos had to complete themed weekly challenges which included coming up with a design, deciding on fabric, and transforming her sketches into real-life curated looks to present in front of judges. She felt the rising pressures of the show’s weekly requirements, but she rose above to create exceptional designs. By the end, Cobos earned First Runner Up in the series finale. Being a college student in Manhattan and a Queens native, Cobos sees her own inspiration in the people around her. "I get inspired by textures and colors wherever I go." Her eyes light up whenever she spots someone wearing something out of the ordinary. When Cobos first began designing she referenced other designers, but she says her upcoming fall collection greatly strays from that as it is a creation all her own. Creating something that is both wearable for men and women is a goal Cobos intends on reaching. It is clear the young designer is excited for her own vision to come to life. Cobos has always had creative energy running in her blood, which she believes comes from her father's graphic design background. From the beginning of her life, she noticed that fashion styling and creation caught her attention. "Going to school for fashion design and construction definitely convinced me even more that this is something I'm really interested in," Cobos says in explaining how her experience at FIT reinstated her chosen life's path. Despite this certainty and a multitude of successes peering over the horizon, it has not always been easy for the young designer to continue working towards launching her own clothing line. Whenever Cobos faces self-doubt, she re-groups on her inspiration found in documentaries of established designers and researches to find their origin stories to trace their current places in the fashion industry. "There's something about seeing other people's achievements that gives me a drive to do the same," Cobos explains. Anyone can see Cobos' drive embedded in the quality of her collection. “Double Waistband Wide Leg Pant” now available via website. "XE" is a gender-neutral pronoun Cobos uses to represent her brand. Cobos turned this pronoun into the brand's name as way to express her own individuality and purpose. "I started this unisex brand because it really bothered me that people would get treated a certain way based on how they look." She experienced this discrimination firsthand when she decided to cut her hair short and sport menswear. This led to being called profanities for showing off her own style. In the future, Cobos hopes to have a more established brand. Someday soon, Cabos wants her collection to be shown live during New York Fashion Week. She hopes to be on the fashion calendar in the upcoming seasons. Besides wanting recognition, Cobos also wants to educate her audiences through her work. "Success doesn't mean anything to me if I haven't achieved that goal of destroying the ignorance that exists when it comes to how we should express ourselves. Life is too short!" As far as the future goes, Cobos is continuing to share the launch of her second collection on her website. You can keep up with Cobos on her personal Instagram and XE official.